EA has finally released Command & Conquer: Rivals for Android and iOS Worldwide. In the game, your objective is to destroy the enemy base as soon as possible. You can do it by targetting the enemy base directly or by capturing the missile platform, which will launch a missile to the enemy base. The victory will reward fuel, XP(you earn XP a certain number of times a day), and trophies. Fuel is required to dispatch the truck for the crate. You can spend one fuel point to reduce the time. Trophies will help you to reach high-division leagues where you will fight against high-level players in real-time. If you are having the trouble understanding the game’s mechanics or looking for tips & tricks, then our Command & Conquer: Rivals guide and Command & Conquer: Rivals tips & tricks will help you. The game gives you five minutes to destroy the enemy base. After this limit, the match will be a tie. Unlike other RTS games, In Command & Conquer: Rivals, you can manually control the units, set targets, and use the elemental strategy. You will command the GDI units first. After reaching level 9, the game will let you access the Nod faction. Tiberium is the resource name, which is required to build buildings; war factory, barracks, helipad, tech lab, and deploy units. Producing these buildings will allow you to deploy the units. For example; building the helipad lets you access the air units. Harvester, this unit will help you in gathering Tiberium from the battle map. 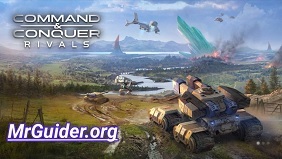 Commander Skill, In addition to the wide range of units, Command & Conquer: Rivals has also provided multiple commanders. Different commanders have different stats & skills. Head to the units menu and scroll right to the last for commander section. Tapping the commander portrait will give you more details. You can use the commander skill(i.e. turret) in the battle over time. How to unlock commanders? You need commander cards, which you get from crates. But there is a level restriction. Tap on any locked commander to check after what level you will get their cards from crates. To level up a unit or commander, you must train that unit three times. It will cost you gold. After it, you will be able to upgrade it if you have enough cards. You get these cards from the crates, daily deals. Bonus -> Upgrading/leveling up or training the units will grant you player XP, required to increase the level. You earn thousands of amount of XP by playing the battles. But only a few numbers of times. You can earn new units or characters in Command & Conquer: Rivals by moving to a high-rank division. Go to the battle screen -> tap the (i) button at the top-right corner to check the division maps, level info, and more. Swipe left to see the next division. As you get the promotion(by accumulating the trophies), you will unlock new units and you will start getting these new unit cards from the crates. So that’s all for now as Command & Conquer: Rivals guide. Let’s learn the basic Command & Conquer: Rivals tips & tricks. This is one of the main objectives in the battle. Don’t let the enemy dominate more missile platforms than yours. If the enemy gets successful and the missile bar’s gauge reaches to the maximum point, you will lose half of the base’s HP. Remember that you can manually move the units, set targets, and take elemental advantage. -> Only moving to the missile platforms & watching enemy movements would not help you. You should target the enemy units rushing toward the base or dominating the base. -> Getting new units -> As you deploy more units on the map or have loads of units on the map, new units will take more time in getting charged. -> Harvester -> You can also move or control the harvester by tapping it. If the enemy is going to launch the missile and you have no units in hand to balance or stop the missile bar, then navigate harvester to the missile platform. -> Speed -> All the units featured in Command & Conquer: Rivals have different speed stats. Some units are fast, while some are very slow. You should know about their speed stats so that you can quickly navigate the best units to capture the missile platform. This could be a match-changer if the missile is about to launch. -> Elemental Advantage -> Some units are strong against a certain type of units. If you tap and hold down the unit icon you will get the details. Or, before the match, you can check the details in the units menu. Additionally, there are some units having special abilities; attack while moving. -> Destroy the enemy harvester for Tiberium. If you are wondering what are the best units in Command & Conquer: Rivals, then your answer is in leaderboard section where you can check top players profile and know their choices. Follow them or build your own best deck by including all types of units; ground, air, vehicle. Command & Conquer: Rivals lets you replay the battles in the battle log. Replay the matches and find where you did the mistakes and how the opponent grabbed the match from your hand. Joining an alliance in Command & Conquer: Rivals lets you access the donating feature and friendly match feature. By playing the friendly match, you can improve the gameplay, learn new tactics. And, the donating/request feature will help you in leveling up units; you can request units cards. In the shop, head to the crate section and grab the free crate. Additionally, in the daily deal section, you can buy cards in exchange for gold coins. If you have more tips, then share with us in the comment section below. This is a great fun game with little time investment because the games are so fast. Take your time to learn strategy- if you don’t then no matter what levels your cards are… lower levels will beat you. This game costs money to play… getting from level 8 to level 9 maxed will be $12K. Simply wrong David. It is entirely feasible to play for free. How have you reached your figure of $12k? I currently have my core units/commanders at L10/L11 and haven’t spent a single dime.